I love experimenting with meatballs because they're a great way to incorporate popular flavor combinations. Tomatoes and basil are always a classic pair so I combined sun dried tomatoes (not in oil) with some fresh basil from my potted plant. The flavor really came through and I loved how the ricotta made the meatballs so fork tender. They were slightly delicate while cooking with the amount of mix-ins, but once nicely browned, they came out perfectly and held their shape. A bit of a warning... you'll definitely want to have extra meatballs on hand. 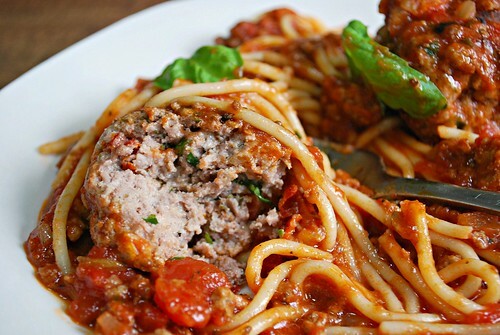 These were fantastic with spaghetti, but they are also delicious in meatball subs. We stuffed our extra meatballs into sub rolls, topped with extra marinara sauce and a nice dose of shredded mozzarella cheese as a delicious way to use the leftovers. Prepare pasta according to package direction; drain and keep pasta warm. Meanwhile, in a large bowl, combine While water for pasta comes to a boil, combine Pecorino Romano, panko, ricotta, ground sirloin, ground pork, eggs, garlic, sun dried tomatoes and fresh basil. Shape mixture into 16 (1-inch) meatballs. In a large skillet over medium-high heat, add oil and heat to warm up. When hot, add meatballs to the pan and cook until browned on all sides. Reduce heat to low and add marinara sauce to skillet. cover and let meatballs simmer in sauce for 10-12 minutes or until meatballs are done. Remove skillet from heat and remove meatballs with a slotted spoon. Add cooked pasta to skillet and toss in sauce to coat. To serve, divide pasta into bowls, top with meatballs and garnish with more Pecorino Romano and/or fresh basil if desired. My goodness, this looks so inviting. I want to run right into my kitchen and make this. I haven't had meatballs in eons. Ohhh, these look and sound amazing! 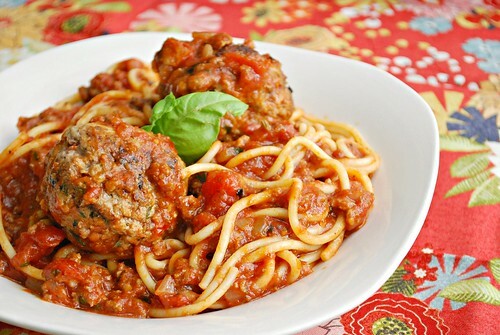 I love Italian food and these meatballs look fabulous! Love the ricotta in them.